Recession? What recession?” the announcer chuckles to thousands of spectators nestled among the peaks of Switzerland’s Upper Engadin valley. I’m further ensconced in the VIP grandstand of the Snow Polo World Cup St. Moritz, where an army of Perrier-Jouët bottles are emptied without second thought into flutes insouciantly clutched by polo fans, bon vivants and the social elite. 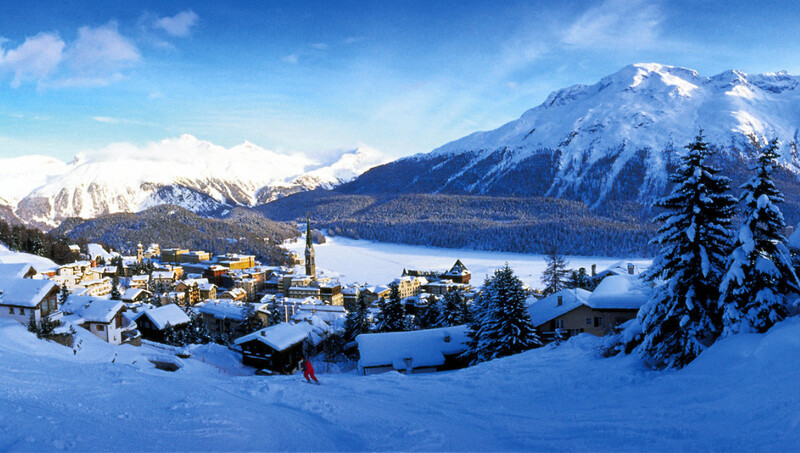 In the shadow of eye-wateringly expensive grand old hotels, they’re dressed in snow-dusted mink coats and accompanied by dogs in matching finery, painting a picture that does seem like St. Moritz is situated in a high-altitude haven beyond the reach of economic pratfalls. 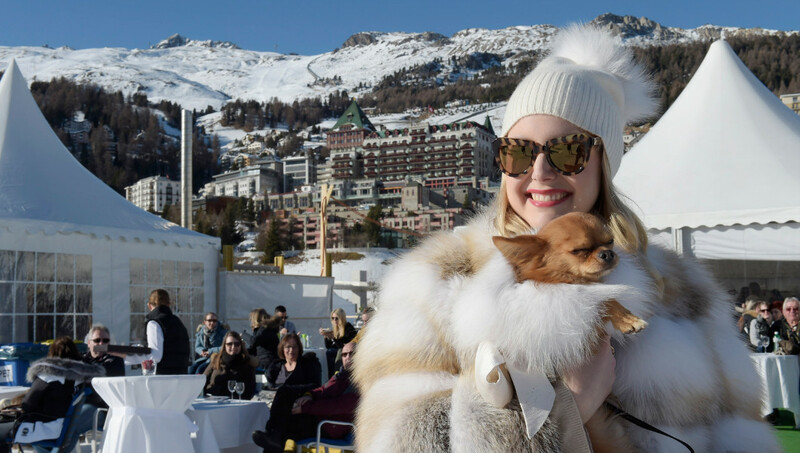 This annual convergence of the posh and the ponies takes place at the tail end of January on frozen Lake St. Moritz, which withstands revellers, pounding hoofs, a heated stable, pop-up restaurants and boutiques, and a heated VIP tent – the latter causing the most concern to the ice’s stability. But fret not – no one else does – quaff another glass of bubbly and join the madding crowd. In an event as inherently over-the-top as this one, the best way to do that is as a VIP, a pricey privilege that opens up a world of Maserati transfers, free-flowing champagne and an exclusive grandstand steps away from that potentially troublesome heated VIP tent. Here, my fellow sybarites have the chance to strip themselves of their decadent furs to reveal chic winter style that anywhere else would be considered laughable below-freezing attire. I float through the decadent crowd, weaving through a winter-wonderland setup of pure-white reindeer statues, fur throws and crystalline chandeliers as I graze on tables laden with Sprüngli chocolates, dainty Perrier-Jouët flutes and a truffle-scented gourmet buffet by local chef Reto Mathis. It’s the first of three days of polo and on the quieter side. The four sponsor-led teams competing for the Cartier Trophy are introduced: Perrier-Jouët, Badrutt’s Palace Hotel, Maserati – and Cartier, who have won the past three years, and close the afternoon with an effortless trouncing of team Perrier-Jouët. 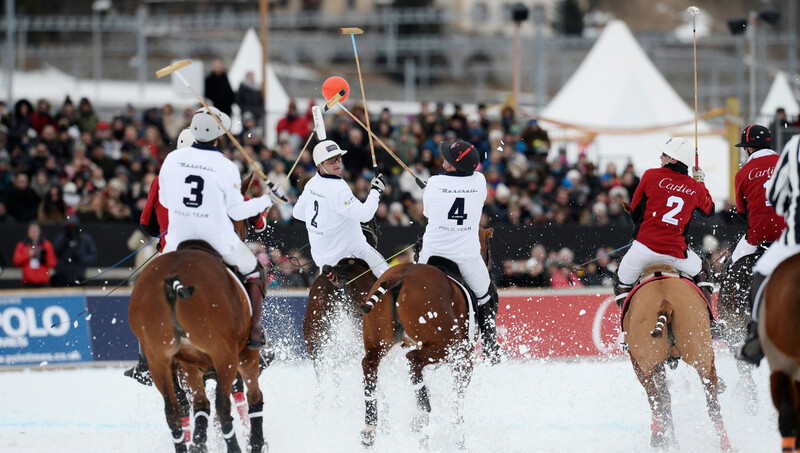 Six-goal-handicap players Nacho Gonzalez and Chris Hyde, who is also considered the world’s top snow-polo player, make them the team to beat once more. Just up the street lies Roo Bar at Hotel Hauser (Via Traunter Plazzas 7; +41 81 837 50 50), where the younger set après-ski al fresco to the tune of thumping music and joyous chanting. Away from the vibrant bar I peek inside the hotel’s fantastic confectionery where I’m introduced to the region’s speciality: the nusstorte (nut cake), a salty-sweet treat of caramelized nuts wrapped in crumbly pastry. Slightly farther on I find the après of choice for the more sedate. Its façade decorated with sgraffito – the traditional Engadin style of carving through white plaster to artful effect – Café Hanselmann (Via Maistra 8; +41 81 833 38 64) is the more civilized choice to take a seat, and I enjoy a warming latte before heading back to my hotel in adjacent St. Moritz Bad. Where the Dorf (“village”) side of the resort currently reigns as the opulent hotspot, this wasn’t always the case; the Bad, or “spa”, side with its natural Mauritius Spring was the resort’s original draw – attracting Romans as long as 3,000 years ago. Today it’s the more low-key location, but not necessarily less on luxury, as I find during my stay at Kempinski Grand Hotel des Bains. 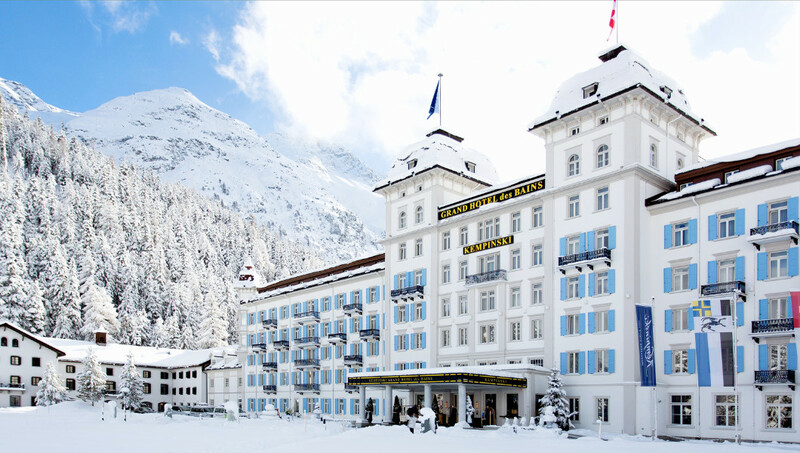 The white, blue-accented and regally turreted grand dame hotel is situated amid a snowy park at the intersection of the resort’s popular cross-country trails – not to mention steps away from the Signal cable car, depositing skiers onto the Corviglia pistes with ease. The atmosphere inside the hotel is just as accommodating; an overall warmth emanates from the pleasant staff, who are ready with a smile and a greeting, and contemporary fireplaces glow in the buzzy lobby bar. Throughout, the modish hotel nods to the resort’s past with vintage black-and-white photographs from the town. Looking for somewhere on-site to dine, Michelin-starred Cà d’Oro’s menu proffers gourmet Mediterranean, but I’m in the mood to taste the region’s bounty. 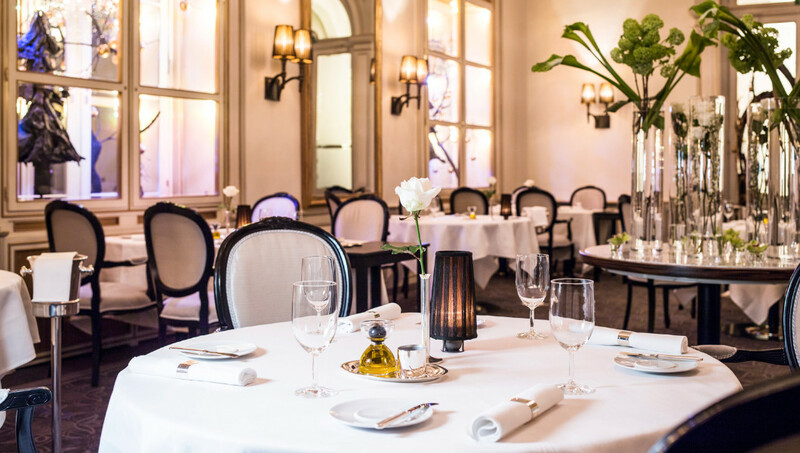 Restaurant Enoteca recently underwent a menu revamp to better portray the enoteca theme, and an expansive library of wine decorates the intimate dining room’s walls beneath intricate cornices and decorated ceilings. Tapas quickly fills my table – fresh olives, antipasti, cured local meats such as Bünderfleisch – before I dig into what seems to be this town’s favourite delicacy: truffle. An unassuming-looking pasta is set in front of me, accompanied by a saucière of truffle foam, to drizzle atop. My waiter then appears with a bulbous black Périgord truffle to shaved over my pasta. As the costly slivers float down, I’m simply told to “say when”. A dangerous game for an indulgent foodie. Returning to my suite, I relish the bathroom’s blissful heated floor after the long winter day, before flopping down on a plush sofa to gaze at the peaks outside my windows. Dabbling in the pillow menu’s options, I opt for a millet cushion scented with Alpine herbs, and know that this night, I will sleep well. As the polo matches don’t kick off until noon, I spend a morning on a “snow safari” to get acquainted with the surrounding Corviglia area. Luckily, I am joined by Susi Wiprächtiger (+41 79 656 95 66; susiwip@bluewin.ch), who has been enthusiastically guiding the visiting elite around the mountain for 30 years. I could hardly hope for a better companion; she’s knowledgeable and full of humorous anecdotes of the one percent. There was the client who didn’t seem to fully understand the privilege of private-jet ownership: “But Susie, don’t you know? It’s just so convenient to have your own plane!”; and the polo attendee who was baffled that her pup refused to wear sunglasses; and the wife who repeatedly urged, “No – more!” to the caviar being spooned onto her dish at a posh piste-side eatery. But not everyone is so unrelatable, and Corviglia is home to surely the happiest lift operator I have ever encountered in my 20-some years on the slopes; try not to be smitten with Anderson, a Caribbean transplant working in the shade of the Marguns lift, greeting everyone with an enormous smile, kind words and warm handshake. After exploring the wide, rolling and immaculately groomed pistes, our final stop is Reto Mathis’s iconic La Marmite (Corviglia; +41 81 833 63 55), positioned at the top of the Chantarella funicular, where stories of caviar excess tend to originate. There may be spectacular views of the surrounding peaks, but it’s difficult to tear my attention away from all of the incredible food on display: a cart laden with cheese, fanciful desserts and those infamous fish eggs. But if there’s a signature dish, it’s the CHF118 ($119) truffle pizza appetiser – a crisp base under melted cheese and shaved white truffle. After swapping my snow gear for some fur, I arrive at the polo final. It’s a fast-paced day, and the subsidiary final sees team Badrutt’s Palace lift La Martina Cup high after a win against Perrier-Jouët, owed in no small part to Argentine nine-goaler Augustin “Tincho” Merlos, who ratcheted up four of Badrutt’s five goals. But it’s the Cartier Trophy final everyone’s anxiously waiting for, and just halfway through the first chukka team Cartier have already gained two goals, a broken stick and a near-miss injury. The teams parry back and forth, but Maserati put up a strong defence and end up leading the match by a point just a minute from the end of the final chukka – Cartier’s Hyde nearly equalises before the final second turns – but it’s not to be. Maserati break Cartier’s three-year spell to take home the coveted trophy. Thrilled for the new champions, it’s time to unwind and I hop into a four-wheeled Maserati pony of my own to unwind at Kempinski’s spa. In a sunlit atrium, a few laps in the pool begin to peel away exhaustion, but it’s the Alpine kräuter-sauna, scented with herbs and laden with rustic wood, that melts any remaining vestiges of stress. But just to make sure, I book a gentle back and shoulder massage, the ideal solution to relieve soreness from a shoulder-first tumble I took on the pistes earlier. And as the spa is situated directly atop St. Moritz’s namesake, the Mauritius Spring, I forgo the usual tea for a fresh glass of the natural mineral water, which, I’m told, has healing qualities thanks in part to a high percentage of iron. It tastes quite distinctive, but I duly toss it back and wait for the rejuvenating results. With the polo having reached its conclusion, the mountain holds my attention. Waking up early one morning, I decide to take advantage of empty, untouched pistes – the so-called “white carpet”. I’m tired and cold and I begin to grumble regrets to myself in the cable car. But after I’ve strapped on my snowboard and begin to carve elegant curves into the untouched snow, my regrets fly away as I swish down the trail. As I play beneath the 3,056-metre Piz Nair, the sun brilliantly breaks free from behind the opposing 4,000-metre peaks. In this moment, I know there’s nowhere I’d rather be.